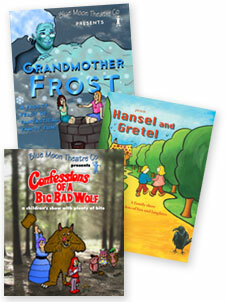 Blue Moon Theatre Company devised and performed shows for children and family audience’s in Theatres, Schools and on the Festival circuit from 1999 to 2015. They also supplied drama and educational based workshops. Between them, the players had an extensive background in Children’s Theatre, Storytelling, Music, Magic, Teaching and Theatre in Education. Technical production, including sound and lighting design was engineered and created by Dan Gale and publicity and artwork by Sue Webber. The company worked with various freelance actors, writers & musicians who included Christina Smith, Bronwen Harrison and Zöe Hughes. Collaboration and booking management was provided by Phillip Bond & PMB Productions. Visit www.bluemoontheatre.weebly.com There is still a website available for anyone to view some of the lovely work we did and also have a chuckle at the old pictures. Big thank you to all the Theatres/Events/Festival Organisers and the lovely audience that booked us and saw us perform during our 16 years of touring.